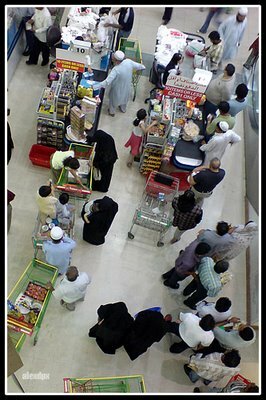 On the eve of Ramadan, yesterday, people went into a shopping frenzy. 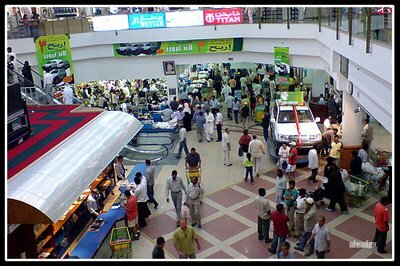 These photos were taken at Lulu Hypermarket along D-Ring Road, Doha, Qatar. 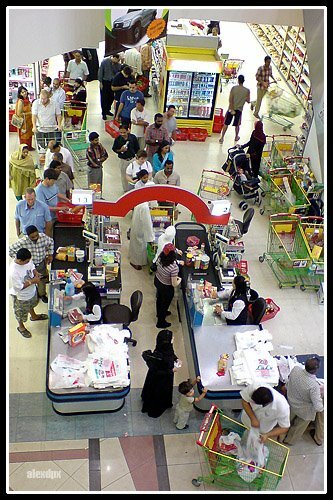 The Lulu Hypermart has always been popular with shoppers and this sight unusual during rush hours. But yesterday, it was like this for the whole day from the time the Hypermart opened at 8:00 a.m. to the time it closed. 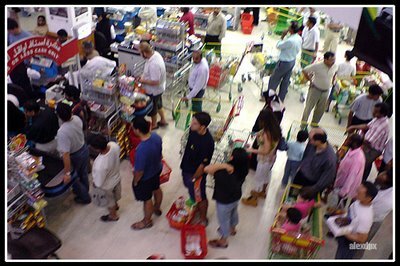 Cashiers / check-out counters all had long lines of shopping carts filled with groceries that to fall in line would mean being able to pay for your purchases will take a lot of minutes, possibly up to an hour. Paying by credit card has also become inconvenient because getting a connection has become difficult due to the onslaught of shoppers at any given time. Asian Games Here I Come!! My ticket confirmation. The actual memorabilia tickets will be delivered some time mid-November 2006 - just in time for the games. 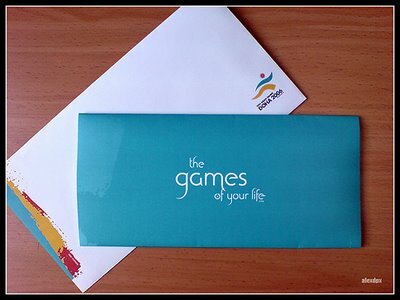 Well designed Asian Games stationery. 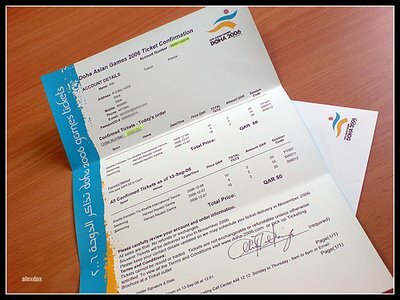 I'm all set to watch and photograph several sporting events at the 2006 Doha Asian Games. I just made it to the first phase of Asian Games ticket sales. The last day was on September 14, 2006. Between September 15 to 26, the organizers will be printing all pre-ordered tickets which may later be considered as Asian Games memorabilia. After September 26, according to the person on the ticket sales box, regular tickets will be available to the public. I suppose the pricing will still be the same but they will no longer be memorabilia tickets. I ordered tickets for the swimming events to be held at the newly built Hamad Aquatic Centre. The main reason is to take photos and send them to my nephew and niece who are champion swimmers themselves. You see, both of them are potential future Team USA swimmers. I hope to give them some inspiration them by showing how international competition looks like throught he photographs I intend to shoot. I also bought a precinct ticket in the Khalifa International Tennis and Squash Complex where I can watch several other sports events (not just tennis, but whatever else is on-going within the complex). Now the question that's probably going on inside your minds is whether I bought tickets for the Opening or Closing Ceremony. Well, the answer is NO. I'm just not willing to spend QR 500 (US$ 137 / PHP 7000) for the Opening Ceremonies. The Closing Ceremonies is cheaper at QR 150 (US$ 41.10 / PHP 2100) but I'm not very keen to watch. Both will be held at the recently redeveloped Khalifa Stadium of which our company is the prime consultant and I am one of its Project Architects. I prefer to shoot the sporting events. But, make no mistake, I will be shooting the lights and fireworks from outside of the Khalifa Stadium - from a distance to avoid the traffic jam. 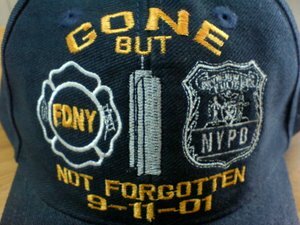 I bought this souvenir cap from New York City in spring of 2005. I don't really wear caps regularly but I buy and collect them from places I've been or important events I've attended. 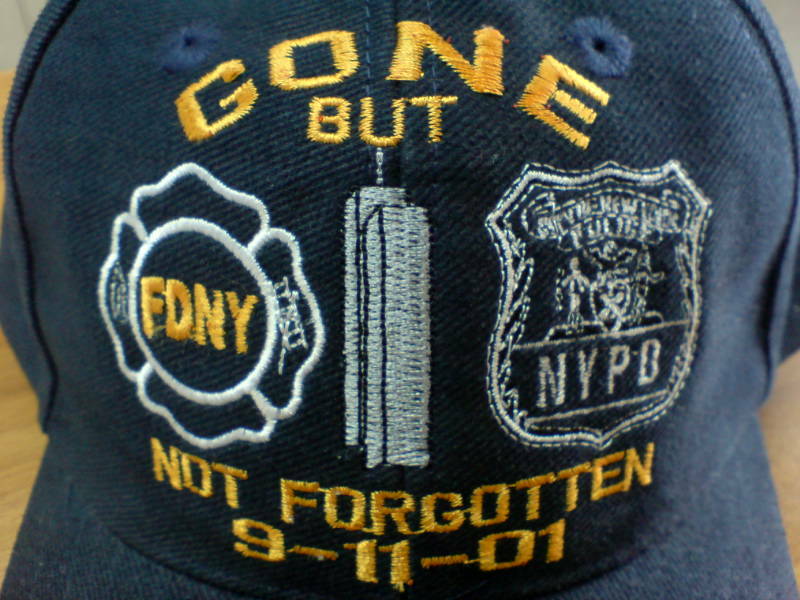 I'm wearing this today to commemorate and honor the people who lost their lives on that dreadful day. An unposed shot while the little girl rests from her play. This was in the Four Seasons Hotel Doha's marina viewing deck. Most of the background colors are white and light and are not distracting. I asked them to sit together here, just rest and pretend I'm not even there. 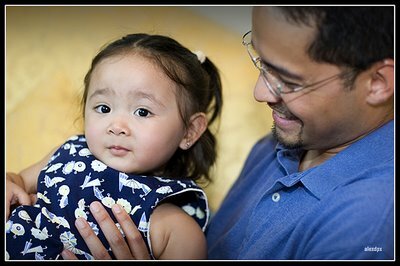 The common idea of a family portrait shoot is to go to a studio where family members will be photographed in a variety of poses wearing makeup, under a lighting setup and in front of a cloth or canvass background. The location may be in the family house's garden or living room but they would still be in a more formally arranged seating. Not that there's anything wrong with that. This is, in most cases, the way you should photograph a family portrait if they intend to print it large, framed and hanged on the wall of a grand living room or family room. This couple has been our friends since we have first known them here in Doha. While their baby girl is playing in the lawn, I asked them to come close together and simply took this shot. They liked it and have told me they will have this printed large. This shot is posed, yes, but they were already standing together as they watched their child play. I simply asked them to look towards me. 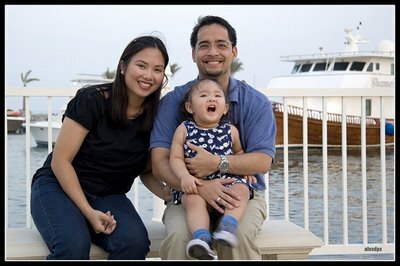 I do the other type of family portrait shoot which is the informal type for two reasons. First, I don't have a studio and don't have much experience in studio lighting setups but, more importantly, it is a personal preference. This fence is slight curved. 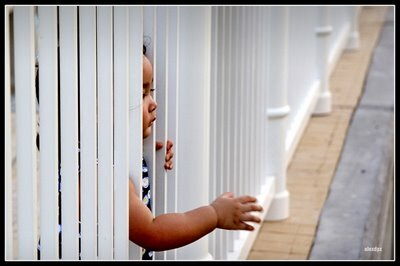 As she looked at the boats through the balusters, I saw this as a moment when she enjoyed where she was at that time. 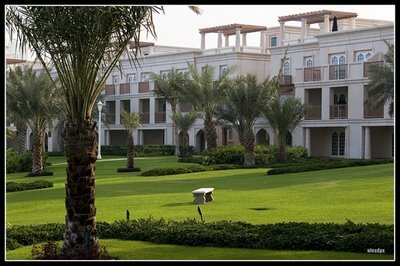 As mentioned in a previous post, we went to Doha Four Seasons Hotel for a family photoshoot. Their rented apartment is not ideal due to a number of reasons. It was a temporary accommodation (they are leaving Doha soon) so they did not bothered with decorating the place and personalizing it. The living room does not have enough natural lighting. To shoot succesfully there, we'll have to have some lighting setup that would make the pictures look like a studio photoshoot. That would not work with our shoot concept. And because of the limited space, we don't see much flexibility and possibilities in there. Little girl playing with Dad on the couch in the hotel lounge. Shooting in a hotel, this is actually the second time I have done this with them. It was a succesful shoot so the idea is a tested one. The first time was more than a year ago when their child was only 5 months old. Now, at 1 year and 9 months, the little girl is a toddler who loves to play and run-around. She's also become conscious about the people around her and refused to go with me or even smile. I am not exactly a stranger but since she does not see me everyday, I am not a regular in her world. And so she was a little skeptical. Getting her to cooperate became a problem. Fortunately for me, her parents know her weaknesses. They brought along her favorite candy and would give her one if she would smile for the camera. She would smile rather quickly though and so I had to be in full alert and be quick to capture those moments. There were times when I had to resort to shooting lika a papparazzi with a long lens and steal some shots out of her. 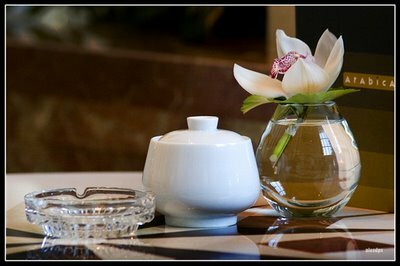 Enjoying the beautiful orchid which was on every coffee table at the lounge. It was a successful shoot, nevertheless. I've shot about 155 during that day - I would have definitely shot more had the weather been more pleasant. Out of that 155, I counted about 110, give or take, that I personally liked. 71% success - not a bad ratio. That plus another 32 useful ones. She found a play pen and immediately dragged everone there. 1. 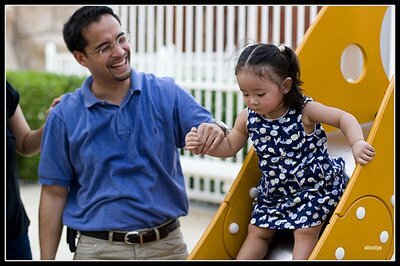 Expect the children to be part of your problem solving activities. Some children easily warm-up to strangers while some are too shy. You need to win their trust confidence, and cooperation. I guess I made a mistake in this shoot. I already knew that one of her weaknesses is Dunkin' Donuts Munchkins and I didn't bring some. It would have been a lot easier to ask her to smile and look at the camera at the same time. We could have also brought her favorite toy but I failed to suggest on bringing that along. 2. Avoid shooting with direct flash. Not only is the lighting harsh and unflattering but some kids may not like the experience of having bright lights constantly bombarding their eyes. This may cause them to refuse to cooperate any further during the photoshoot or other future photoshoots. You should not, therefore, use your camera's built-in flash. She had a lot of fun here and it shows in her smile. 3. Use an articulated flash gun with a diffuser. This should be the type where you could redirect the flash into various positions so that it may be bounced off the wall or ceiling. The diffuser will soften the harsh light further. 5. Keep your camera in "firing mode" and be alert on moments between each family members' interactions. Unposed photos come out usually the most natural and best looking. I find it best to shoot with the shutter in continuous mode. With subjects off-guard, especially the camera conscious types, they reveal their natural smiles and expressions. This is one of those moments where I appreciate the EOS 20D's 5 frames-per-second speed. 6. For posed shots, I find it best not to say "cheese" or give any cue to cause a "posed" smile. To me, that strategy only works with a large group. It helps a lot when the people you are shooting are confident with the photographer and facing the camera for that matter. Keep a steady conversation and watch out for moments. You, as the photographer and artist, should "see" your subjects and be alert to click that shutter at the right time. For this kind of shoot, you may also use continuous mode. 7. Avoid grand backgrounds. They compete for attention with your subjects. Choose a simple one, without too many distracting elements. A cluttered background causes the viewers eyes to wander around and loose concentration on looking at the subjects. Remember, the photoshoot is about the family, not where you are shooting them. Unless, of course, this was requested your subjects then you should include a photo showing the background that they liked. But again, put the emphasis on the people which are the subjects of your photoshoot and don't make it the main theme of your photoshoot. 8. Take candid moments of individual members of the family. Parents may want you to concentrate on photographing their children other than their group photos but take the time to shoot Mom and Dad as well. Mom's solo, Dad's solo, or both of them. Dad and kids, Mom and kids. 9. Choose a good location. Their home should be the ideal location but if it's not flexible or suitable, I would suggest beaches at sunset, a local park or, if possible (as we have done) a hotel lobby. 10. Bring plenty of films or if you're a digital shooter, plenty of memor y cards. Shoot plenty and liberally. This does not mean be careless with your shots but I'm sure you will (and they will) be glad to have plenty of shots to choose from. And with that, you're giving your client good value for your services. In a span of just about two hours, I've done 155 shots where I gave my client 142 useful shots. A good number, turned out great of course. 11. Bring spare batteries. One fully charged battery for your camera may last for a particular shoot but bring a spare one anyway, just in case. Your flash gun will consume more power so don't get caught up dead with a useless flash. Shooting informally would be more fun for your subjects and it allows them to be themselves and reveal their personality. As the artist in the shoot it allows me to present these people's "inner" beauty - who they really are. While a formal studio portrait presents a record of a time when they were made to look good on pictures, an informal shoot presents a record of a time in their lives when they were together and happy. Susan Storm Large in "Rockstar: Supernova"
I'm a little sober at the moment because my bet for Rockstar: Supernova bid farewell last night. Susan Storm Large has been eliminated from the competition. It wasn't really that much of a surprise for me. After her performance of David Bowie's "Changes" (which in my book is her most memorable in the show), her following ones were not exactly to Supernova's liking but she really had some difficult songs to work with. Okay that may sound a little biassed - of course every song is difficult to work with but, c'mon . . . "I Will Survive"??? Her rendition though was a different and interesting one but the fault of choosing the song no one else would rather sing was hers. Because of that, her performances suffered and it started to emerge that, extremely talented as she is, her artistic interpretations were not the right fit for the band. However, watching this weeks episode, I thought she came in strong with her performances impressing Gilby Clarke during the song-writing clinic, impressing Dave Navarro during the cover performance of another David Bowie song and impressing everyone, including Supernova themselves, when she performed her original song, "Ladylike", and leaving drummer Tommy Lee lost for words. I thought she has hit a grandslam here and expected her to win either the opportunity to rock with Supernova or the encore performance on elimination night. But she got neither. Iceland's Magni got to rock with Supernova and The Australian Toby Rand got the encore and the prize "Hondamobil", as Jason Newsted called it. (It was nice of Toby though to dedicate his encore performance in memory of the late Steve Irwin, The Crocodile Hunter, another favorite personality of mine.) It was then that I felt that Storm might be sent home if she ends up in the bottom 3. And she did. She was also the only remaining rocker who has not performed with Supernova. She must have felt the same when she performed "Wish You Were Here". The power of her voice was lost and compared to Marty Casey's rendition of the same song last season (Rockstar: INXS), this was easily forgettable. Tears rolled down from her eyes and dedicated the performance to her mother afterwards. Maybe, but I believe part of the reason is the spectre of the "Tommyhawk". That means, she'll be sent home. Tommy Lee couldn't do it so he passed the duty of delivering the bad news to bassist Jason Newstead. Storm Large bids goodbye to her fans at Week 10 of "Rockstar: Supernova" show. Before joining the competition to front Supernova, Storm was already a star in her own right and already has her own legion of fans. Her 10 weeks in the show has earned her some more and with that, I know that she will not go down in her music career. To quote another competitor, Dilana, "She'll be back LARGER THAN LARGE." The crystal chandelier hanging magnificently at the lounge ceiling. A friend of mine invited me to an afternoon snack at the Four Seasons Hotel Doha. Actually the main purpose of our visit there was a family photo shoot. He has asked me to photograph him and his family. His idea, which was a candid, outdoor shoot without the artificial studio lighting, matched with mine. But we needed a good location to do the shoot. I will write more on that in my next post. For now, let me concentrate on the nice afternoon experience during and in-between photo shoot. An accessorized coffee table at the lounge. 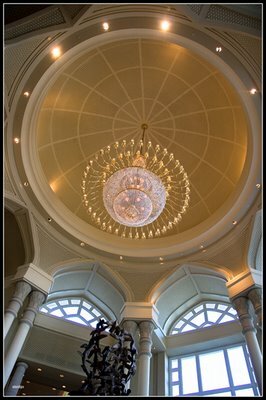 I had snack with my friend and his family at the lobby. 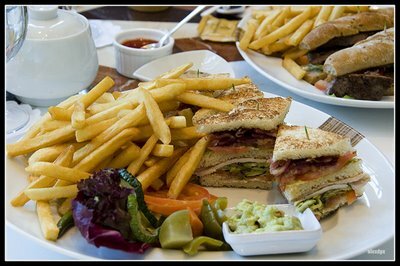 For myself, I ordered a decaffeinated latte and a club sandwich. They were both really nice. I have no comment on the food except that they were served quite plenty that my snack was good enough for me to last until breakfast the next morning. So if a light snack is what you have in mind, this is not the place to go to. 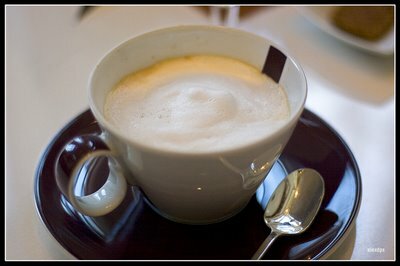 The decaffeinated latte I ordered. Considering the heat and humidity outside, the cool air-conditioning and the soft seats combined with the sight and sound of running water from the central fountain were really a welcome experience for the senses. They made the interior mood really comfortable. It was very nice. I only had this one complaint that the lobby does not give you enough outdoor views. Although there are huge windows, they are mounted high up above the door. They, therefore, are there to admit natural light not to offer outdoor views. Afterwards, we went outside to the beach and swimming pool area to take advantage of the wonderful natural lighting that afternoon sunlight's warm glow gives. It was still humid and everybody started to sweat. Fortunately, there was a light breeze to cool us off a bit. There were still a few hotel guests enjoying the pool and the beach. Then we went to the board walk where you can have a view of the marina and the hotel's man made beach. We stayed there a while until the sun has set. Most of the more successful photos I took were actually shot there. Beautiful place! I feel like I could spend hours and hours just sitting there and enjoying the view. My snack - Tuna and Bacon Club Sandwich. When the temperature has dropped a little, I think I'd go back there with my wife and do just that.